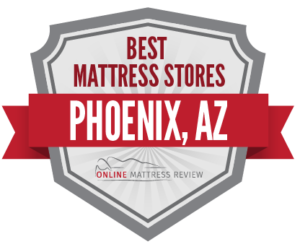 We’ve gathered together a list of the best mattress stores in or near Phoenix to help you on your search. With no less than 70 mattress shops in Phoenix, locals have an abundance of options, from alternative to traditional, from twin to double-king. This can be both a blessing and a curse for shoppers, who have to decide where to buy a mattress in Phoenix when there are an almost overwhelming number of options. Some mattress shops specialize in quality, others in value or convenience. A number of mattress stores in Phoenix even manufacture locally, meaning greater quality control and a lower carbon footprint. What’s the best choice closest to you? Read on to learn about some of the best options for mattress stores in Phoenix by neighborhood. The Downtown Phoenix mattress store with the highest reviews is Tuft & Needle (735 Grand Ave.), makers of premium innovative foam mattresses with an almost cultlike following. In addition to earning top marks for sleep comfort, Tuft & Needle products provide an entertaining unboxing experience, as the mattresses arrive compressed in a compact package and expand to full size upon opening. Another innovative option is Simmons Bedding Co (2100 South 7th Ave). This mattress store sells not only mattresses, but an innovative sleep tracking system that works with your smartphone or Amazon Echo. Searching for a more traditional place to buy a mattress in Downtown Phoenix? There’s Billy’s Mattresses (742 N 12th Ave), a source for affordable mattresses produced locally. Mansion Furniture (1727 E. McDowell Road) also sells mattresses- along with bedroom sets and other furniture. If you’re wondering where to buy a mattress in Phoenix at the very lowest price, however, consider pre-owned. Furniture Bargain Outlet (1400 N 19th Ave.) is a resale furniture and mattress shop in Downtown Phoenix specializing in high-quality, affordable mattresses and furniture previously used in hotels. Camelback East is second only to Downtown for density of highly-rated mattress stores in Phoenix. Mattress Man of Arizona (2323 E Indian School Rd), a family-owned retailer in consistently earns top marks for affordable mattresses and friendly service. Camelback East is also home to multiple franchises of the Mattress Firm. Shopping at this national chain, rather than a small, local mattress shop, means access to a vast selection of mattress sizes and styles, including foam, hybrid, gel, pocketed coli, eurotop and more. This one district of Phoenix is home to Mattress Firm and Mattress Firm Clearance (4456 E Thomas Rd), Mattress Firm Camelback Colonnade (1831 E Camelback Rd) and Mattress Firm East Camelback (3240 E Camelback Rd). If you’re looking for an affordable mattress store in Midtown, try out J & A Mattress Liquidators (2202 W Camelback Rd) or Phoenix Mattresses (1611 E. McDowell Rd. ), which both specialize in bargain buys. Looking for premium quality? Visit Brooklyn Bedding (668 W Camelback Rd). Despite its name, Brooklyn Bedding is a Phoenix-based mattress company that retails nationally, and has earned rave reviews from the likes of Men’s Fitness and Consumer Reports. Like Tuft and Needle, they deliver an innovative, high-tech foam “bed-in-a-box”, which ships in a compact roll and expands to full size. West Phoenix mattress stores are fewer and further between. Brooklyn Bedding (1628 S 51st Ave) is one option for high-end foam mattresses. Mattress Factory (2949 W Catalina Dr) is another, and earns good reviews for its selection of highly affordable mattresses. There are fewer options for mattress stores in Phoenix south of the city center, but shoppers can find at least two big-name retailers in the area: Mattress Firm (2070 E Baseline Rd) and Sleep America (5240 W Baseline Rd), both of which offer the wide selection of big-box retailers. One of the mattress stores in North Phoenix that gets the most positive reviews is Arizona Premium Mattress Company (22201 North 24th Ave). This store is locally owned and earns points for friendly service and premium, natural latex mattresses. The Mattress Center (39512 N Daisy Mountain Dr) is another locally-owned mattress store, and has a reputation for selling affordable mattresses. Need something more? This shop sells headboards, bedding and other accessories as well.